Coming to The Lyric, Stuart, FL. Feb. 22nd, 2015! Mutts Gone Nuts - Feb 26! Live from Nashville - Feb 23! Duck Dynasty Meets Carnegie Hall! Gaelic Storm returns- Feb 19th! John Mueller's​ 50's Dance Party - Feb 13, 2017! Lily Tomlin - Feb. 6 & 7! Beehive: The 60's Musical 30th Anniversary Tour - Feb 1 & 2! Youth Arts Celebration - Oct. 22nd! Pat Donohue plays "Maple Leaf Rag"
TITO PUENTE JR. CIERRA EL FEST DE SALSA DE BOCA DEL RIO, VER. Sierra Hull "Daybreak In Dixie"
AMBROSIA with Joe Puerta, Burleigh Drummond & Chris North - Feb. 3, 2016 at 7pm! Second song of the second concert of the evening. SARGE cracks up host, Craig Ferguson with his riffs on growing up black and Jewish. The encore number that ended a great concert. SARGE takes random requests from the audience in an amusing fashion and delivers magnificently. Tour of 1978 in Atlanta, GA.with Shenandoah. Menopause The Musical is coming! Groove back in time to the sounds of the 70s with the incomparable Mimi J! BUY TICKETS - Coming December 9th, 2015! See Walter Parks, October 3, 2015 at The Lyric! A Sing & A Hit! See Sarge at The Lyric ~ Feb 27! Sarge cracks up host, Colin Ferguson with his riffs on growing up black and Jewish. Sarge ~ February 27th at The Lyric! Live at The Lyric! Thursday, February 19, 2015 at 7pm. La Diva Tenors, coming to The Lyric, Valentines Day 2015! Regis Philbin shares some stories and talks about his new book "How I Got This Way." Vocal Trash ~ Coming January 15th! ​An Evening with Clint Black ~ Coming to The Lyric, Nov. 20 & 21, 2014! Mediaeval Baebes ~ December 2nd! 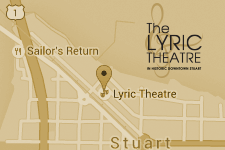 Lyric adds new shows to season! ​Marilyn McCoo & Billy Davis, Jr.
Merry Bronxmas with the Bronx Wanderers -Dec. 15 & 16, 2014! Guys & Dolls ~ In Concert! Rick Braun "A Walk Down Broadway"
TONIGHT! Travis Tritt ~ Solo Acoustic Performance - at The Lyric! Travis Tritt "Solo Acoustic Tour"
Mel Tillis Live In Branson "Ruby"
Check Out our exciting Winter line-up! The Treasure Coast LOVES The Lyric! A glimpse at The Lyric's Brithday Bash Gala! ​It’s a party and you’re invited! The Big Lebowski ~ Cult Classic! Official movie trailer for "The Big Lebowski" - showing now on PictureBox. Lyric adds shows to season! Art Cinema comes to The Lyric! Meet the cast of Next To Normal!